“Up for sale is this vintage PAiA 4700 Modular Analog Synthesizer W/ upgraded keyboard controller and extras. It’s condition is “Used” but system is in very good condition. The case and fittings are all in great shape. 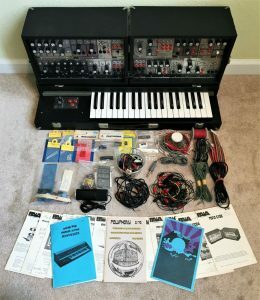 Both the synth and upgraded keyboard were assembled by a former PAiA engineer and this sale includes a bunch of extra hardware left over from his build. In addition to manuals for every installed module, some of the extras include various patch cables, IC chips, switches, potentiometers, a remote volume knob as well as an additional un-assembled Watt Block module (w/ power supply). I do not guarantee that every module and/or feature works as intended. I’m not familiar with vintage modular set ups, so minimal testing has been done. However, I was able to create a patch that confirms the system powers up and can produce sound (see youtube video). Just from the appearance and condition alone, I really see no reason that it is not working properly although you are purchasing it as it sits.